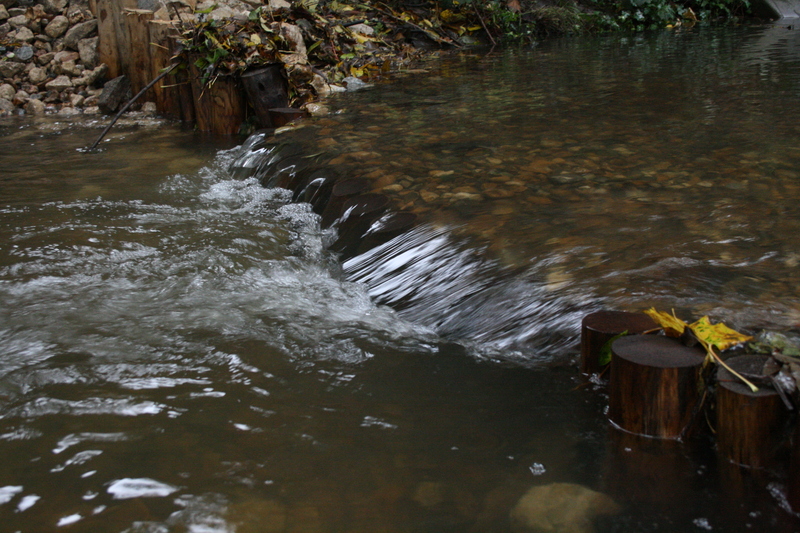 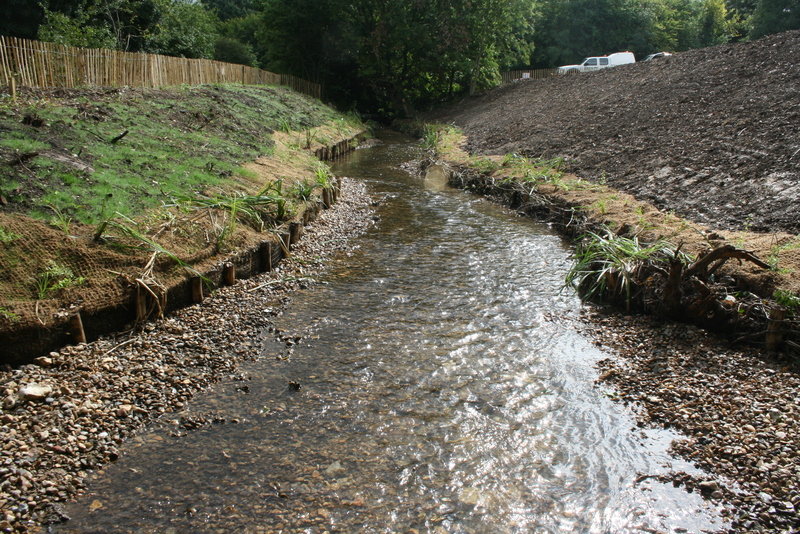 After months of involved planning, the first two weirs on the Hogsmill have been broken out, returning natural flows to the upper river. Land and Water, the contractors undertaking the work, started on site last Monday (5th August) with preliminary preparations. 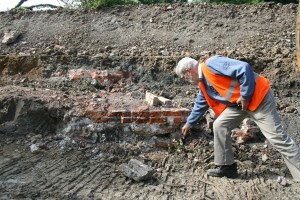 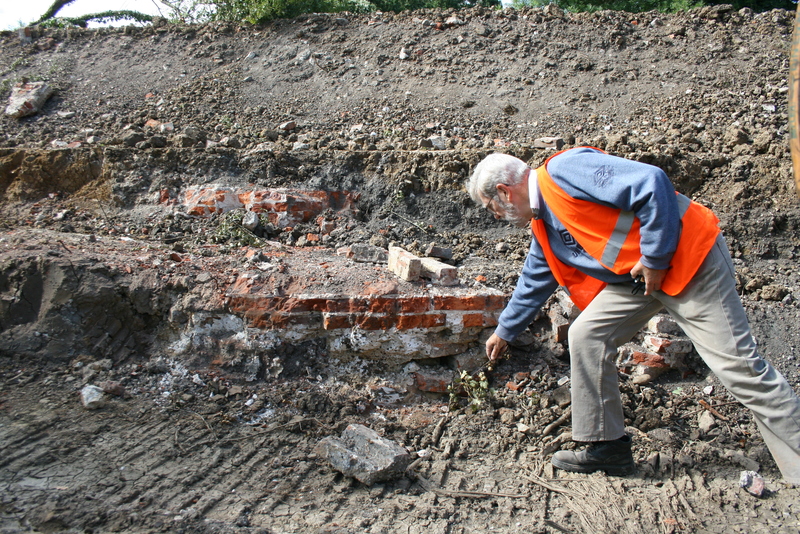 This involved establishing the site compound and tree clearance around both weirs to allow access for the large excavators. The extra light will also assist in vegetation establishing, which is key in the success of the chosen bioengineered bank solutions. 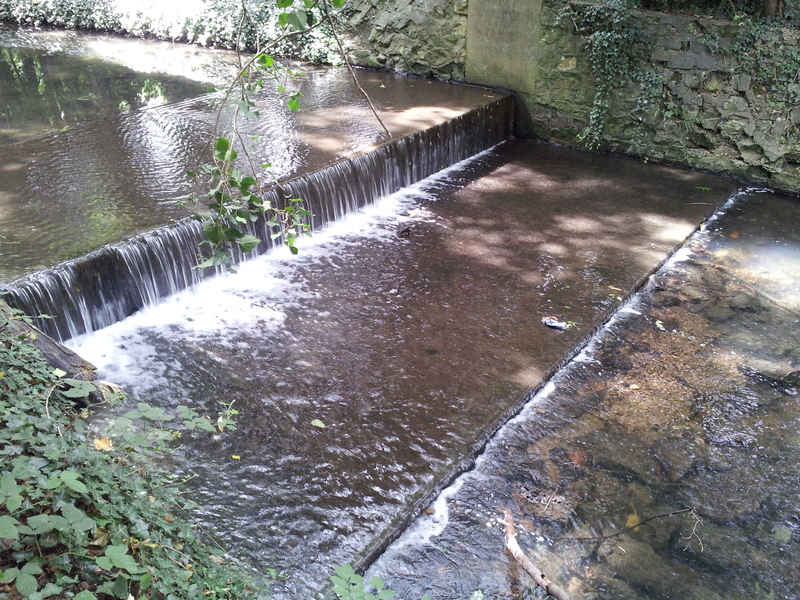 The bank on the downstream weir was also benched to provide a stable platform for the machines to sit on. The footpath adjacent to the upstream weir was diverted into the recreation grounds and a temporary footpath laid so that the regular cyclists, pram pushers and dog walkers do not have to get their feet dirty. 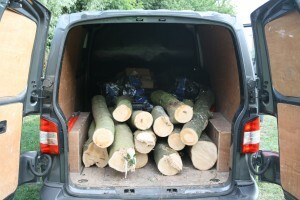 Next came the fun bit. 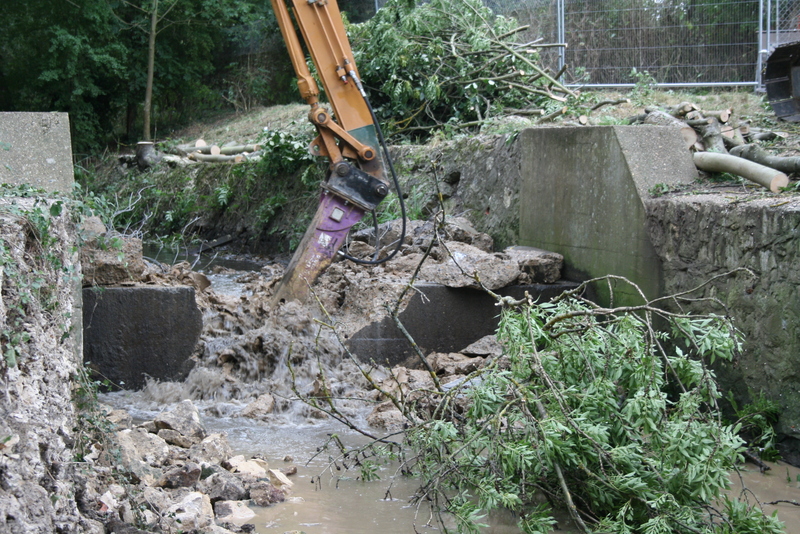 Armed with a breaker, the excavator was set loose on breaking out the downstream weir’s abutment walls, shortly followed by the weir itself. 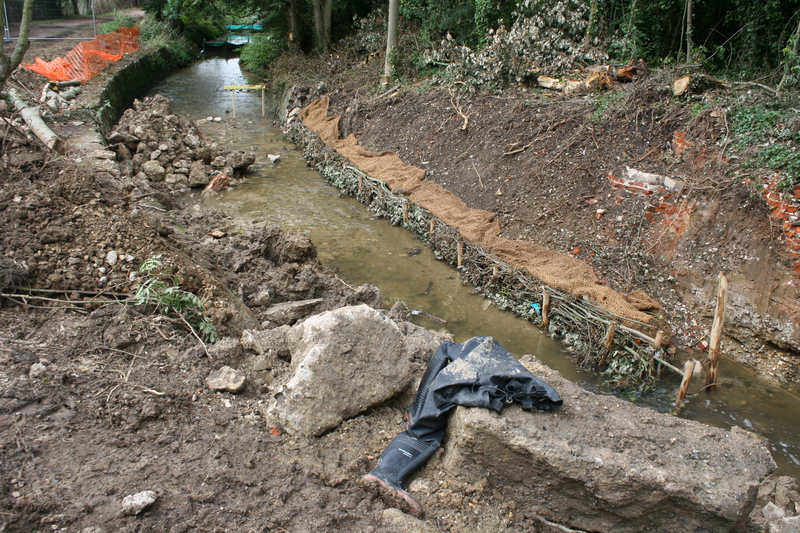 The tough, re-inforced concrete put up some resistance but ultimately it succumbed with satisfaction as lump after lump fell. The ponded section of river upstream quickly drained through the new channel. 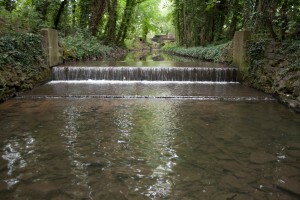 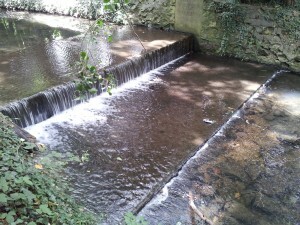 The same process was then repeated on the upstream weir. 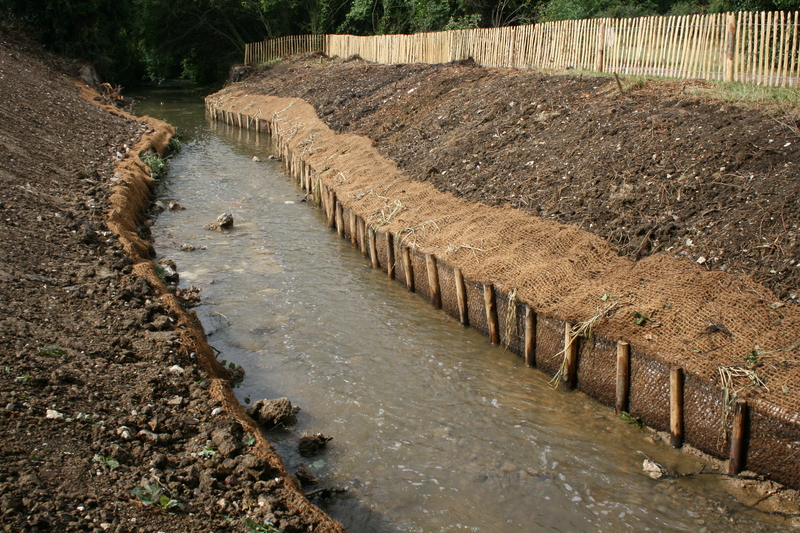 Where the large, vertical concrete and stone abutment walls once stood forming a distinct barrier between river and banks, these are now being replaced by low lying, soft engineered banks which gradually slope down to the river. 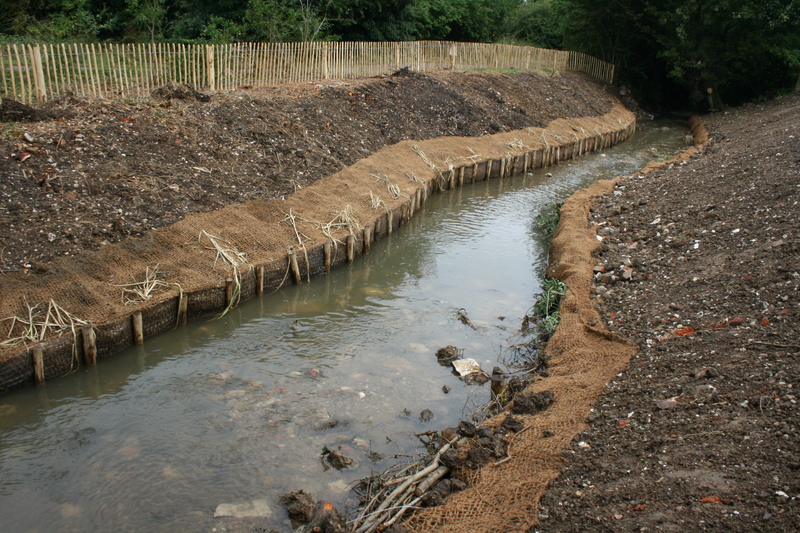 These will shortly be planted with a variety of riverine species. 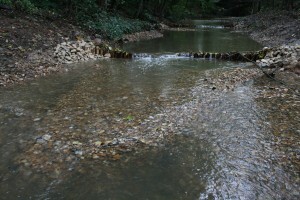 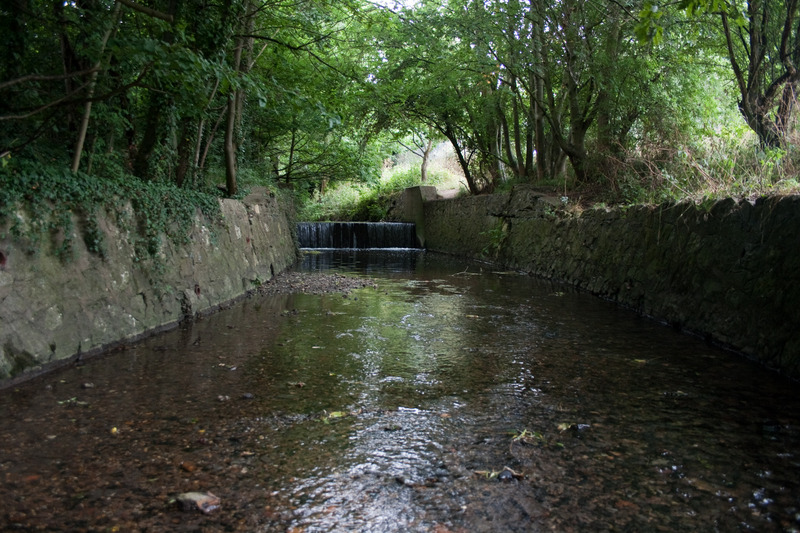 In total approximately 350 metres of river has been returned to a more natural flow regime providing potentially key spawning and juvenile fish habitat. 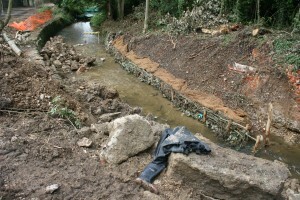 The removal of the weirs now means that there is a 1.5km uninterrupted stretch of river. 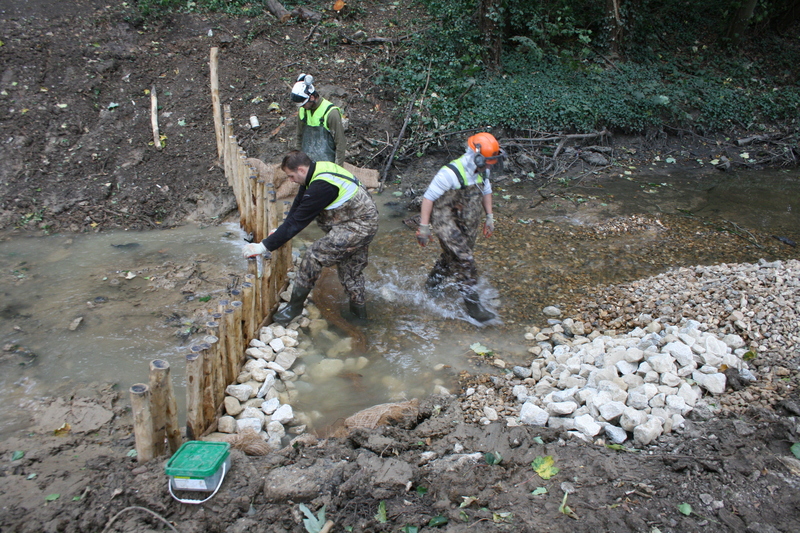 A big thank you for all of those that have helped to get the project this far, especially Stewart Cocker at Epsom and Ewell Borough Council, Matt Horritt who helped us with the flood risk modelling, Cain Bioengineering for the designs, all the bods at the EA , Tom Cartmel at Land and Water, and all the guys’ hard at work on site. 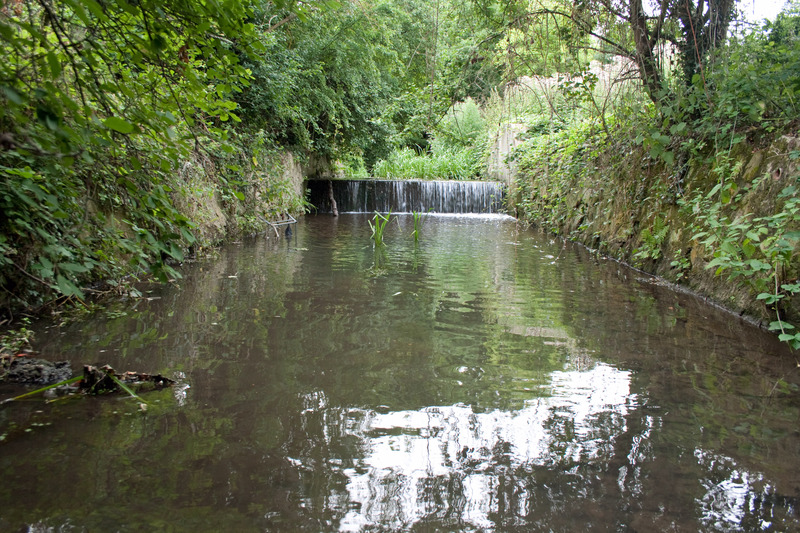 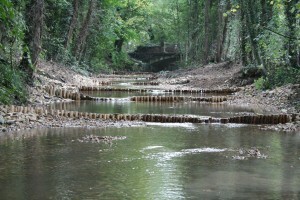 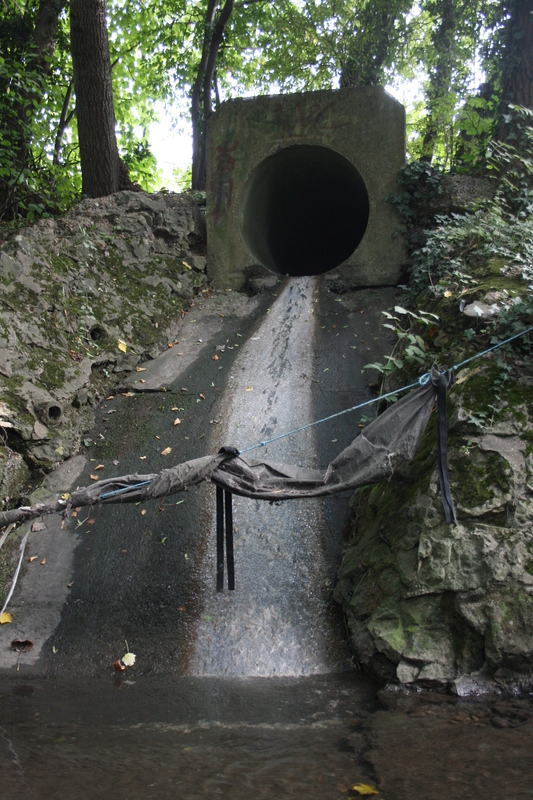 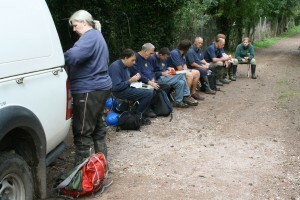 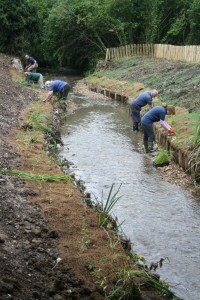 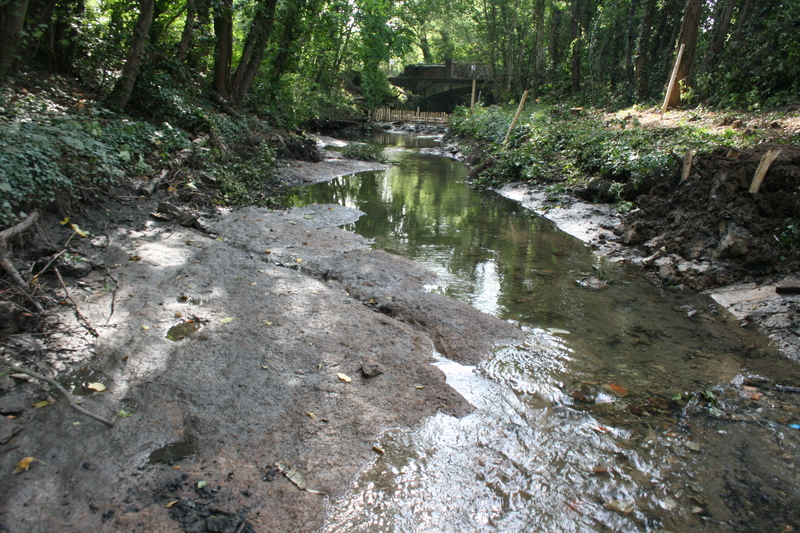 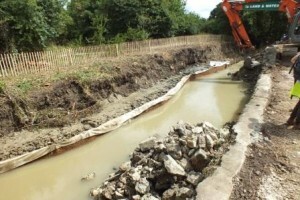 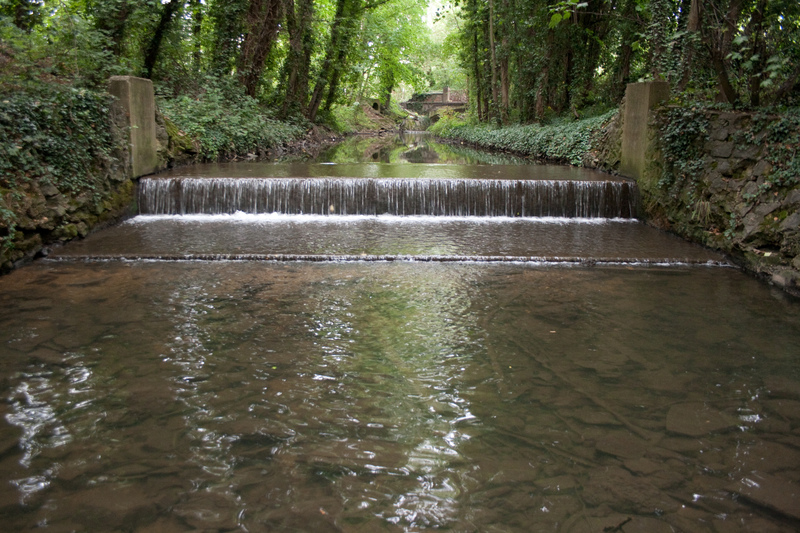 This entry was posted in Uncategorized and tagged Hogsmill, River restoration on August 14, 2013 by Toby. 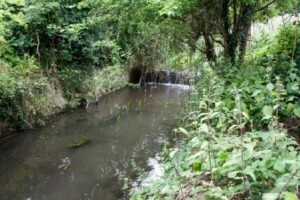 The Public Notices published in the Sutton Guardian on 14 March 2013 included details of some road closures proposed for Butter Hill, Mill Lane and Denmark Road in Carshalton. 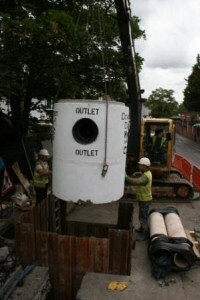 These road closures are proposed so that the Wandle Trust can install silt traps (hydrodynamic vortex chambers) into the surface water drains as part of a vital project in order to intercept sediment and other harmful pollution which is currently getting washed off the roads and into the river. Unfortunately, the details given in the Sutton Guardian were inaccurate, stating that the closures would last for a duration of 12 weeks. 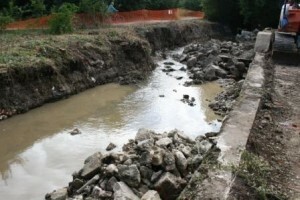 In reality, the worst case scenario is that each road will be closed for 2 weeks. Radar surveys are currently being undertaken to establish if we have the room to install the silt traps between the utilities in the road. 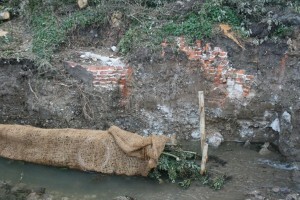 We aim to know the answer to this by the end of the week (Friday 5th April). 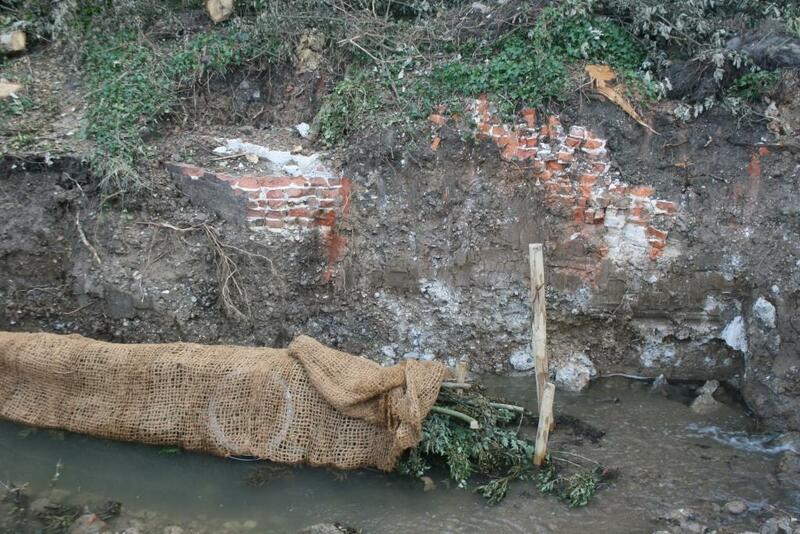 With this information we will be able to identify if and where the silt traps can be installed. 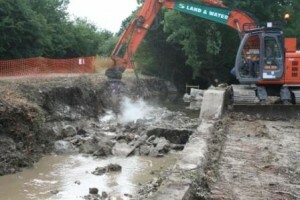 Where possible, if the roads can remain open they will be. 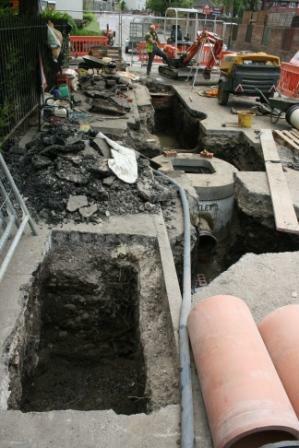 If closures are required due to the only space being in the centre of the carriageway, we will give all concerned plenty of advanced warning of the disruption that may be caused. 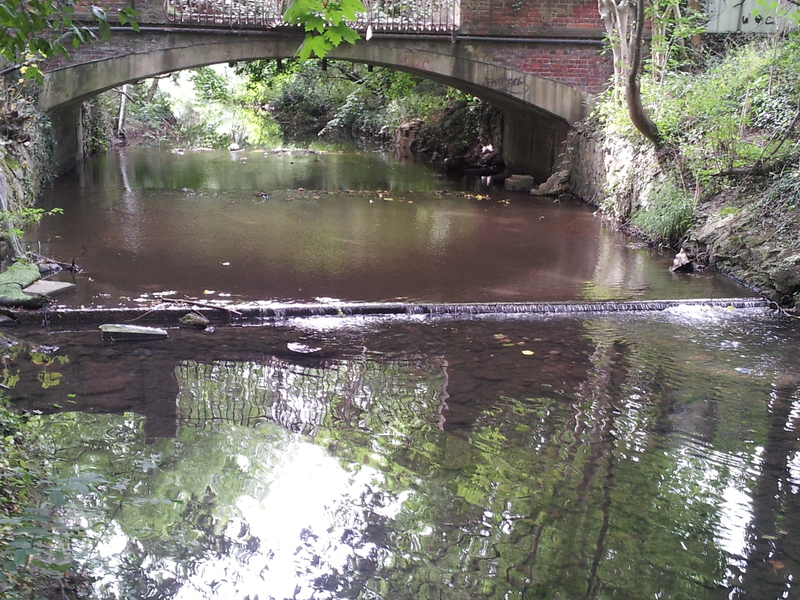 The Carshalton arm of the Wandle is currently struggling to establish a sustainable population of fish, particularly trout. We believe that a very significant reason for this is the amount of road run-off entering the river. 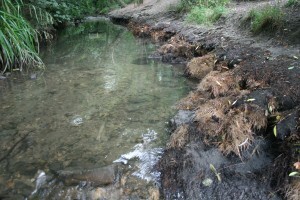 It is reported that between 20-40% of sediment in an urban river derives from road run-off. This has many negative impacts. 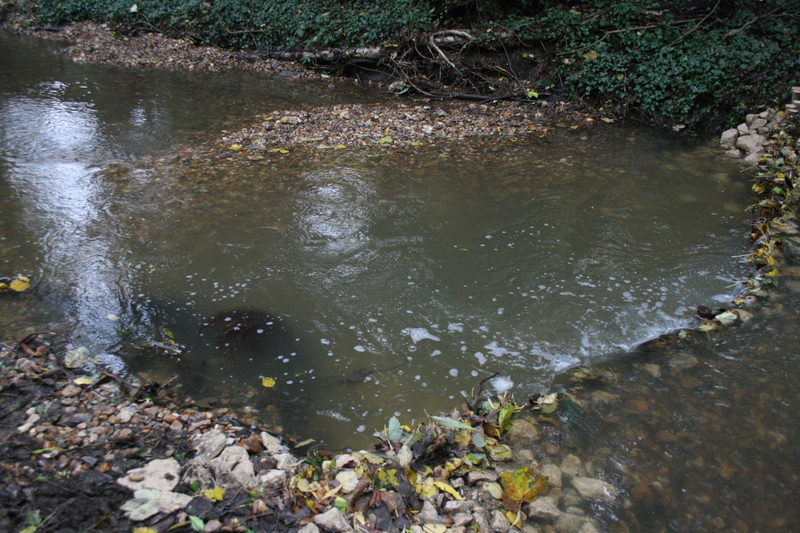 Trout require clean, uncompacted gravels to spawn in. With so much sediment entering the river, these gravels can get clogged up, meaning it is difficult for the trout to dig redds (nests) and even if they are successful, the sediment limits oxygen from reaching the eggs, causing them to suffocate. There is also the impact of contaminants being washed from the road into the river, including a wide range of organic contaminants (so called persistent organic pollutants, POPs) which include polyaromatic hydrocarbons (PAHs), polychlorinated biphenols (PCBs), hydrocarbons, dioxins, pesticides, herbicides and many heavy metals. 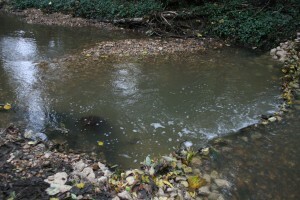 This is a list of things that have no place in a river! The full impact of pollutants are yet unknown on most aquatic life but unsurprisingly they are considered detrimental, not only to fish but on the whole food chain from invertebrates upward. 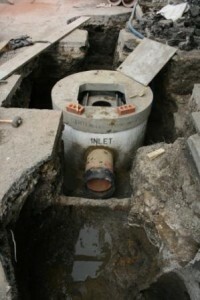 The advanced design of the silt traps we’re proposing will help to limit the amount of these contaminants entering the river, and once they’ve been installed, the only evidence of their presence being a couple of manholes. 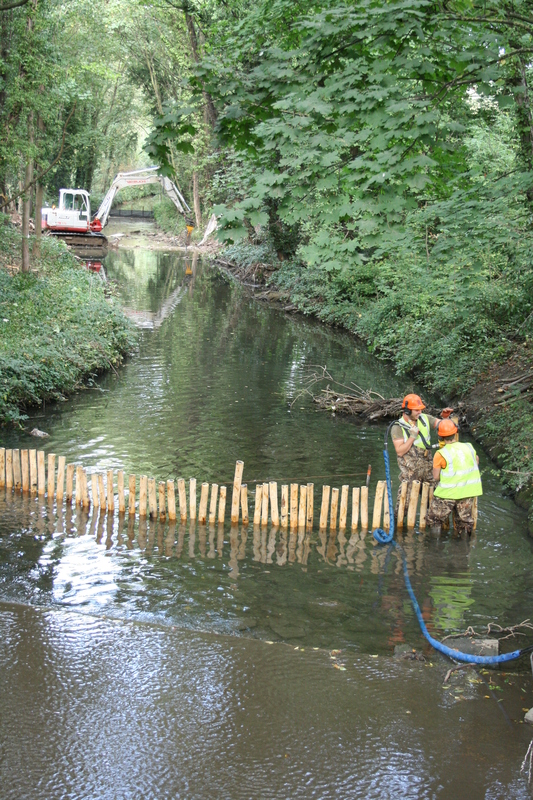 Installing these silt traps will help to greatly improve the condition of the Carshalton arm of the Wandle, making it a much more pleasant place for the local community to spend time around. 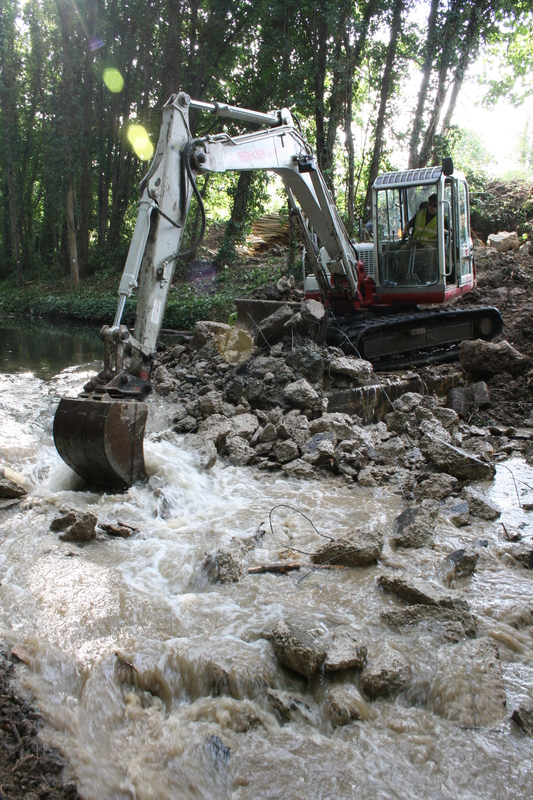 The Wandle Trust has been working closely with Sutton Council to draw up the Streetworks Application and other plans, giving careful consideration to limit the disruption caused by works. 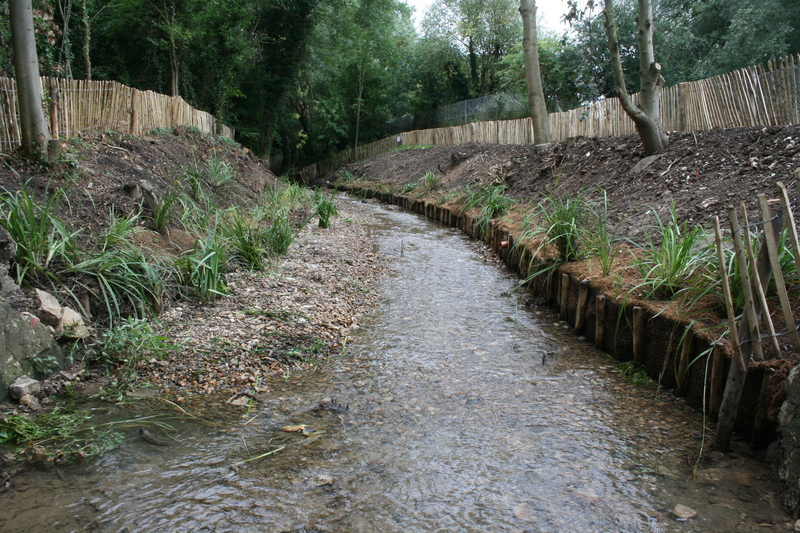 We apologise for any inconvenience caused but hope that you will support us with these actions which will greatly help to improve the Wandle! 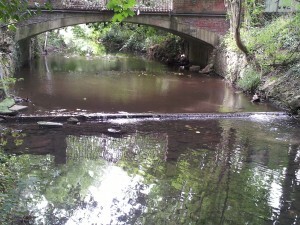 This entry was posted in Uncategorized and tagged Pollution, River restoration, Wandle on March 19, 2013 by Toby.